These little popovers are very subtly spiced with cinnamon and cayenne. I wanted them to go well with our kale and chickpea stew (which they did!) but also to be good warmed up in the morning with butter and jam. It’s really sinking in that it’s winter, here, with icy drizzle and everlastingly grey days, and these are a good antidote. They have a nice warm color, a mild sweet flavor, and a lovely light soft texture. They’re also incredibly easy to make! I was reading Mrs Beaton’s cook book, the other day (as one does) and I think these are related to her chapter on “batters.” Which makes them also related to yorkshire pudding, perhaps the most famous of batters! 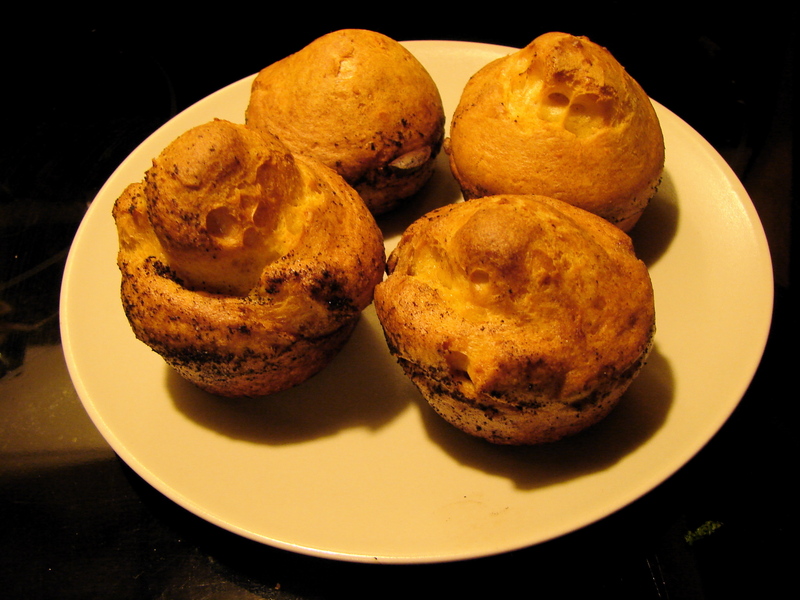 Yorkshire pudding is cooked with a bit of dripping in the bottom of the pan, and these are cooked with butter. I let the butter get burnt, because I like the flavor, but if you don’t, just put the pan in the oven for a minute before you’re ready to cook. Mix the dry ingredients. Break in the eggs and add the milk and pumpkin. Beat with a whisk till just blended. Preheat the oven to 450. This made 10 small popovers, so I used a 12-muffin pan and just left two empty. Put a sliver of butter in 10 slots in the muffin pan. Put it in the oven till it just melts. Pour a ladleful of batter into each melted-butter-containing- hollow. It should come to about 1/2 an inch below the top, but just make sure they’re evenly distributed. Bake for 15 minutes, then reduce the heat to 350 and bake for a further 15. They should be puffed and crispy and brown on top. They’re best hot right out of the oven! This entry was posted in bread, recipe, Uncategorized and tagged cayenne, cinnamon, popovers, pumpkin, yorkshire pudding by Claire. Bookmark the permalink. Hi, these look delicious but I can’t see in the instructions where you add the pumpkin? I assume it’s at the same time as the milk? Ack! I hate when I leave out a step. Thanks for pointing it out. Yes, you add it with the milk. I’ll fix it in hte recipe.